Cochlear Implant surgery may be an alternative for people with severe to profound sensorineural hearing loss. Cochlear Implants change sound into electrical impulses and use these impulses to stimulate the hearing nerve. The brain interprets the impulses as sound. 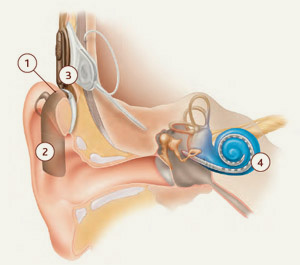 The external sound processor is worn behind the ear or on the body. It captures sound, then filters and processes the sounds, turning it into digital code. The internal implant converts the digitally-coded sound into electrical impulses and sends them along the electrode array that sits gently in the cochlea (the inner ear). The implant’s electrodes stimulate the cochlea’s hearing nerve, bypassing the damaged cells that cause hearing loss, sending impulses to the brain where they are interpreted as sound. During an outpatient procedure, an auditory prosthesis is implanted under the skin, bypassing damaged parts of the auditory system. The implant sends electrical signals directly to the auditory nerve. When used with an external speech processor and a microphone or headpiece, the cochlea implant patient has enhanced hearing. Potential candidates for cochlear implants undergo a complete audiological evaluation to determining the type and degreeof hearing loss and helpfulness of hearing aids. Other medical tests may be conducted as well. These may include an ear examination and X-rays of the cochlea to make sure there are no external or middle ear diseases that might prevent implementation. Cochlear implant patients will work with their doctors to determine which cochlear implant device will provide them with the best hearing performance. Surgery is performed under general anesthesia on an outpatient basis. Your cochlear implant surgeon will discuss the surgery and post-operative recovery period with you. Patients require a four-to-six week recovery period to ensure complete healing around the implant site. Following the surgical recovery period, rehabilitation is initiated at BHSC and included fitting for the external speech processor and headpiece. During this process, the sound levels of the cochlear implant are adjusted specifically for the patient, a procedure know as mapping. Patients typically return to the BHSC several times during the first weeks or months that follow the initial programming of the cochlear implant. Visits to the audiologist will lessen over time until they are only necessary for annual checkups or to address any unexpected changes. Additional visits with the audiologist and speech-language pathologist for aural rehabilitation will be scheduled according to the patients' individual needs. The cost of surgery and rehabilitation are covered by most third party insurances.